From the heavy-duty Silverado to the fuel-efficient Colorado, Patsy Lou Chevrolet has the most extensive selection of Chevrolet trucks in the east Michigan areas. Renowned for their ruggedness and durability, Chevrolet trucks have long been the vehicle discerning motorists rely on when they need to get the job done. And with a lineup that boasts awards ranging from J.D. Power’s “Most Dependable Large Heavy-Duty Pickup” to Motor Trend’s “2016 Truck of the Year,” it’s clear that Chevrolet are leaders in the field of truck manufacturing. So don’t settle for less in your pickup: check out the Chevrolet trucks at Patsy Lou Chevrolet today. No matter which Chevrolet truck you decide to drive, you can count on it being built from the strongest material available, meant to take on the roughest jobs you can throw at it. 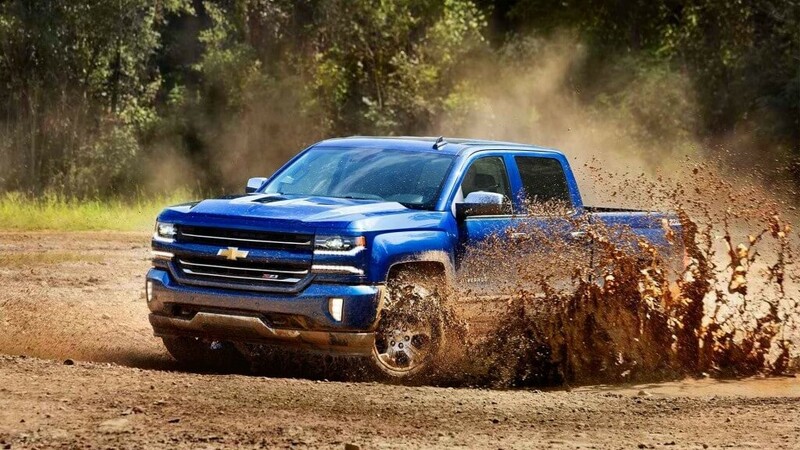 Their innovative and stylish exterior designs exude toughness, but the performance speaks for itself: The Colorado has a fully boxed frame that delivers a smooth ride even on the roughest roads, while the Silverado boasts a maximum payload rating of 3,534 lbs. Of course, this hasn’t stopped others from singing these trucks’ praises- the Silverado was named J.D. Power’s Most Dependable Large Heavy Duty Pickup” award two years in a row. Performance has always been at the forefront of the Chevrolet brand, and their lineup of trucks embody this dedication in spades. Each model offers incredible horsepower and torque, as well as a flatter torque curve so you get the power you need sooner than other trucks. As for towing ability, the heavy duty models offer upwards of 23,200 lbs. of towing capacity, and even the midsize, fuel efficient Colorado can tow a respectable 7,700 lbs. with its engine. Pair these powerful engines with state-of-the-art trailering control technology, and you have a lineup that can take on just about anything. 2016 Colorado: For drivers and families looking for an affordable, comfortable pickup, the 2016 Chevrolet Colorado is the ideal vehicle. It’s one of the most fuel efficient midsize pickups on the market, delivering 31 mpg hwy, while still providing 7,700 lbs. of towing capacity when you need to travel with something extra. And at a starting MSRP of $20,100, the Colorado is capable of fitting into just about anyone’s budget. 2016 Silverado 1500: An icon of reliability, the 2016 Chevrolet Silverado 1500 is one of the longest lasting trucks you’ll find on the market today. And with stylish accents like its sculpted hood and exterior LED lighting, you can drive comfortably, knowing that even as your truck outlasts its competitors, it will always be in style. 2016 Silverado 2500 HD: The Silverado HD line was named “Most Dependable Large Heavy Duty Pickup” two years in a row, and its easy to see why. The 2500 is built with high-strength steel from its stylish hood to its roll-formed steel cargo box, designed to take on heavier payloads with a more durable frame. Add that to a full lineup of available tech, from Wi-Fi to USB ports, and you have a vehicle that goes beyond functional, to be truly exemplary. 2016 Silverado 3500 HD: The most powerful pickup in the Chevrolet truck lineup, the 3500 HD is capable of handling the toughest jobs you can throw at it. With the available Duramax 6.6: Turbo-Diesel V8 engine, it can tow a massive 23,200 lbs., as well as a staggering payload capacity of 7,153 lbs. Plus, the innovative trailer control technology it offers, including Trailer Sway Control and a Diesel Exhaust Brake System, gives you the utmost control over even the most unwieldy loads. Chevrolet trucks are some of the best in their class, and Flint, Grand Blanc, and Flushing residents can see what all the fuss is about right now at Patsy Lou Chevrolet, located at 5135, Corunna Rd in Flint. If you have any questions about the vehicles we offer, contact us online or give us a call at (810) 732-7500. Come test drive a Chevrolet truck today!